For best results, artwork should be supplied via email as an attachment – send us an email here, along with a description of how you’d like to have your artwork embellished onto the garments (size, position, colours, embroidery/print method, etc). Preferably, artwork should be supplied as vectored graphics (such as native .AI or .EPS files) exported to .PDF, whilst text should be saved as curves and all paths as a single layer outline, rather than as a layered graphic. For designs with multiple colours, each area of colour should be saved as a separate object without any overlapping of adjacent colours/objects. If you’re unable to provide artwork in vector format then an artwork set-up charge may apply. If supplying non-vector, raster graphics (such as .JPG or .PNG files), artwork should be provided at 300dpi or above, and at print size. Raster graphics will begin to pixelate when enlarged and may affect the quality of the final print. Please note – taking a raster graphic (.JPG, .PNG or similar) and saving it in a vector file will not convert it to a vector graphic! Colours will be matched as closely to your designs as possible (unless requested otherwise) though some format variation may occur. Screen Printing – for multi-colour designs, each colour should be sent over as a separate element, with a .PNG or similar showing the full image. Embroidery – vector files are not required for embroidery designs; a high resolution (300dpi+) .JPG or .PNG should be adequate. For further details, please refer to our sections on Screen Printing, Embroidery, Transfer Printing and Vinyl Printing. For screen, transfer and vinyl printing the maximum size for a single image/print is approx. A3 (297x420mm) though less for smaller garments (ladies’ or children’s sizes). Max. print size for sleeves is approx. 100mm, though may be smaller dependant upon size of garment. Max. embroidery size for other items (backpacks/scarves, etc.) is determined by the space available. Printing and embroidery may be positioned anywhere on the garment, allowing for at least 25mm clearance from seams/zips, etc. and provided there is suitable access. 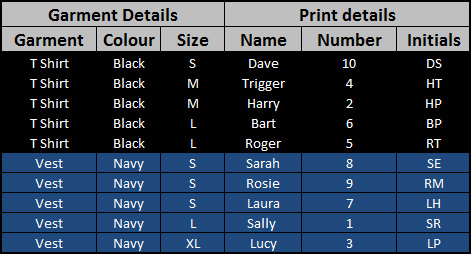 Details for an order, such as sizes, colours or individual print or embroidery details (names, positions, numbers, etc.) should be sent across as an Excel file or similar spreadsheet – as the original, editable file, NOT a screenshot, photo or exported version (such as .PDF) of the spreadsheet. For a ready-made order details spreadsheet, refer to our Resources section for a downloadable template.